Lindsey has a very diverse professional background but landed in the Financial Industry about 5 years ago as a recruiter. She developed a passion for working with advisors and understanding their needs. Lindsey loves working with financial professionals and helping them take their business to the next level. Before going back to school in 2010, Lindsey touched many industries from retail sales to professional labor to mortgage loan officer. With such a diverse background Lindsey has experience working with a wide breadth of personalities and professionals. Because of this Lindsey is very good at making her clients feel comfortable and engaged. Lindsey prides herself on her relationship building skills and genuinely cares about each and every client. Some of her clients over the years have turned into life-long friends. 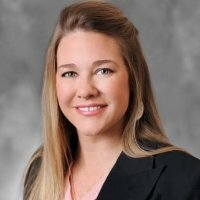 Lindsey is passionate about truly understanding the client's needs and partnering with them to determine the right ClientWise service to help them accomplish their goals. Lindsey was born and raised in Kansas City and still resides close to her friends and family. She enjoys spending time outside, painting and cuddling with her fur babies, Layla (dog) and Kamiko (cat).